I never used a computer to power the esp. It was a 5v wall plug USB socket. The problem was that I was using a USB to serial adapter before using a voltage regulator to drop it down to 3.3v. The USB to serial adapter must have been drawing intermittent power surges that would cause the esp to reset. That problem was completely eliminated when I used an old USB cable with only the 5v/gnd wires connected. Thanks for the example. Just as with the http server, this code can likely be adapted to work with the Arduino IDE. Stay tuned, I may explore this possibility soon and share the results in a blog post. I have found that many ESP8266 users shy away from the EspressIf SDK. That is too bad as it provides a very powerful development platform. My toolchain uses the Eclipse IDE with the SDK. Thank you for your deep analysis! It helped me a lot! If you can adapt for the Arduino IDE.. that would be incredible! Your comment is unclear as to your expectation. The sketch referenced in this post was developed using the Arduino IDE. Thank you. I have the same problem so I was happy to find your article. I have tried the capacitor, regulated supply, a flush function, and added some delays. Still get random hangs. Using the Arduino WebServer example on D1 mini lite chips and WEMOS D1 and some little esp-01s. All were hanging. Usually getting 12-24 hours until hang. We will see how your suggestion goes. There is always the interrupt reset dog. Longest duration I have experienced without a reset was 49 days. Even with a UPS powering my device and cable modem, I have observed occasional glitches in the internet service which is out of my control and another cause of reset. If you are in a densely populated environment, competition for the limited wifi channels, even using your own private router is another ocassional cause of resets out of your control. I have been thinking about trying a dual redundant system (2 esps) as method of eliminating resets entity as the odds of both eps resetting at the same time is nearly zero. Update. Another clue or new problem. I have 5 esp01 running on my local LAN. I rebooted the router and none came back online as responding web servers but they reconnected to the router..
You might consider having your esp save some values to the flash memory (nvm). These values are saved even after power is removed. This would allow you to pinpoint where in the code it is hanging. You can also , upon detection of loss of wifi, store the pertinent values identifying the state of the esp in nvm and force a reset instead of simply reconnecting. You get a clean start and maintain the state of the esp, as if nothing happened. One more thing, I like to limit code in one iteration to say one sensor reading, any more and you may risk blowing the esp timeout and as result, have a reset. I added your code in and only got an hour uptime out of the deal. 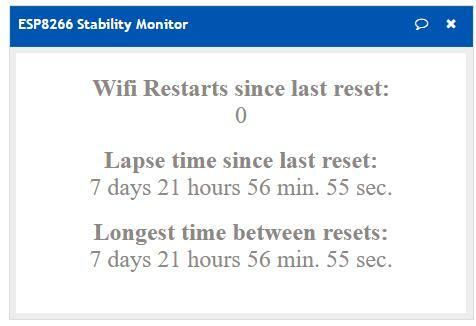 I ran the reconnect wifi counter out to client.print and it stayed a zero. Now I am thinking it's stuck in a loop somewhere. I can still ping the device and the router says it's connected. These are all good ideas. I shortened my code up to the original gpio/1 or gpio/0 instead of reading many empty pins. Then I got it started and banged on the F5 key 10 times and it quit.